The purge function is a handy way to make an incorrectly displaying Wikipedia page display correctly by clearing the page's server cache. This forces the wiki software to rebuild the page completely. Some pages use transclusion to incorporate subpages or templates. If you can't see the transcluded pages properly, purging might help. However purging does not apply new categorisation and "what links here" changes from templates; in these cases a null edit is required. Anyone can request that a purge be performed, including anonymous editors. Issuing the command is not harmful to the operation of the website, but consumes a small amount of additional processing power to rebuild the page. You may want to try first to refresh the page using your web browser. Note: purging may take a few minutes, though it usually happens immediately. Click the "Edit" tab at the top of the page. Click "Save" at the bottom of the edit box without making any changes. This is a null edit. Nothing is saved. A null edit will not record an edit, nor make any entry in the page history or in Recent Changes, etc.. Anonymous users will have to confirm purging. This is normal, just click on "OK". You can't break anything by doing this. Save the page; this provides a permanent link on the page for purging. One may also just use preview, click on the link there to get to the purge page. Logged-in users that have the Friendly clock enabled can purge the page by clicking the time at the top of the page. It acts as a purge link. There is another gadget that adds a "*" tab to the top of the page. It purges the page's server cache when clicked. To enable the purge links go to "my preferences," and then to the gadgets tab. Search for "purge." Enable the clock gadget and/or the purge gadget. Both provide purge links at the top of the page. In Commons preferences there is a third gadget to add a toolbox link (sidebar usually) to generate new thumbnails. It shows up on image description pages on the Commons. Normally, when a change is made, the page is marked as "touched" and the software will create a new copy of the page for the server cache. However, when a change is made to a subpage or template, but not to the article page which transcludes it, the article page is not marked as "touched," and a new copy is not generated for the cache. Therefore anyone viewing the article page may see a cached page which includes old versions of the subpage or template. The purge command forces the server cache to purge the old version of the page. The next time the page is viewed, the page will be rebuilt from scratch, including fresh versions of all subpages and templates, and a new copy will be made for the server cache. Note that this may take a few minutes in extreme cases. Purging an image's description page can be used to force the software to regenerate all the thumbnails for that particular image. For images from the Commons purge the image description page on the Commons. The purge gadgets seem to work most consistently to force rescaling of all sizes of thumbnails of a particular image. See above: #Purge gadgets. It may take a while for MediaWiki to get around to doing the rescaling, especially if it is an animated GIF. It depends on how busy the MediaWiki software is, and on the task queue. After a while reload the page that contains the thumbnail while bypassing your browser cache (Ctrl-F5 on Firefox). This may pull up the newly rescaled GIF thumbnail. See: WP:BYPASS. If this doesn't work you may need to try later. You may need to purge that page with the thumbnails also. A simple page purge may work. If there is still a problem, ask for help at Wikipedia:Village pump (technical). If an image thumbnail will not regenerate successfully after the original image has been purged, it is probably because the server has cached an error page with the URL of a thumbnail, but the page is not purged because the actual thumbnail does not exist. The solution is to request the thumbnail with an unusual URL, say by appending "?1" to the end. The thumbnail should then be successfully generated. Finally, do action=purge to delete the cached error. You should only do this if you have tried the above method and an action=purge, and neither have worked. When looking at an article page you may see old versions of thumbnailed images. There may be newer thumbnails, but they aren't showing up on the article page. To force the newer thumbnails to show up, purge the article page. For editable pages the simplest way is do a null edit (see WP:Null edit). 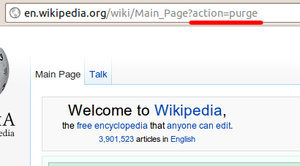 Click the edit link at the top of the page, and then save the page without making changes to the wikitext. Nothing is saved. A null edit will not record an edit, nor make any entry in the page history or in Recent Changes, etc.